Located on a particularly scenic portion of the Northern California coastline, Point Arena is known for dramatic coastal shelves, steep bluffs and spring-fed waterfalls. Few people who come to walk here and marvel at this spectacular landscape realize it also shelters threatened and endangered species, including the Point Arena mountain beaver and Behren's silverspot butterfly. In 2000, Point Arena was named a California Coastal National Monument. The Trust for Public Land’s purchase of more than 530 acres of this sensitive landscape was the key piece in a long-term effort by the community to protect more than 3,700 acres of open space, including ten miles of coastline near the town of Point Arena. 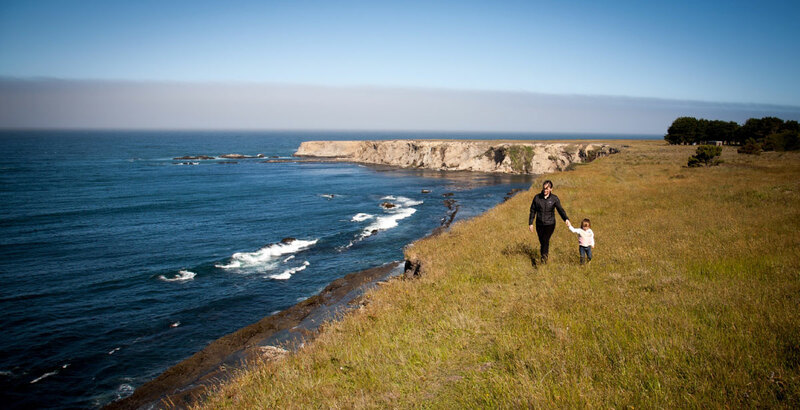 Creating an unbroken swath of protected land between Point Arena, Stornetta Public Lands, and Manchester State Park led to a successful campaign to make Stornetta the first on-shore addition to the California Coastal National Monument in March 2014. Now the Monument of 1,100 miles of small islands, rocks, exposed reefs, and pinnacles stretching between Mexico and Oregon makes landfall at Point Arena, making it truly accessible to the American public. This project was made possible through the support of many, in particular the Point Arena community and the Bureau of Land Management, with funding from: The Land and Water Conservation Fund; California Coastal Conservancy; California Resources Agency; California Department of Fish and Wildlife; The Wyss Foundation; and George Sardina, M.D. Fund for Nature.